Recently, I was attracted by this bright red flower that looks like a big rambutan fruit. The flowers are very striking and spectacular. On second thoughts, I think they look like porcupine spikes too. What do you think? Are you growing this plant in your garden and what is your common name for it? This is an evergreen that grows under the full or partial sun. It flowers freely throughout the year and the blooms are attractive to bees, butterflies and birds. It can be grown as a small tree or trained as a shrub by prunning. The plant is quite free of pests. Propagation is from seeds and cuttings. 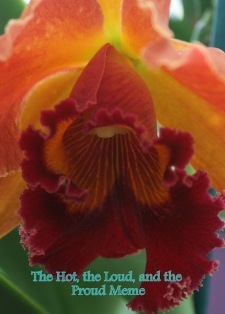 My post today is dedicated to Flower Lady from Florida, USA of Plum Cottage Gardens blogs. Thank you for being the first commenter of my previous post on the Asian Foxtail. I'm sure you'll be inspired by her lovely exotic flowers and beautiful quotes. This is end of April 2010, time for The Hot, the Loud, and the Proud Meme started by Noel of A Plant Fanatic blog. Please follow my link here to participate or view other spectacular shows around the world. Post publication update: Bernie is growing this plant in her garden. She has written a post about it at My Dry Tropics Garden blog. The post is here. This native plant of tropical Asia and Australia has multiple 'identities', having a different name in different cultures. Which common name do you like? * Post publication update: In Malaysia, buntut is commonly used to mean 'bottom' while in Indonesia, buntut means tail. So, I think there is an error in my translation and that it is more correct to use 'Dog's Tail' since the term originated from Java. The flowers come in clusters in shades of violet, pink and white. Yes, 3 different colours here! The plant can be found in the jungles of Southern China and Southeast Asia, hence it is a native plant of Malaysia. The roots, leaves and flowers have medicinal uses. In Chinese herbalogy, it is used to stop bleeding, reduce fever and relieve cough symptoms. Have you see this plant before? Anyone has this plant in Florida or other parts of the world? My post today is dedicated to Carmen from Germany of "Între vis si realitate" (between dream and reality) blog. Thank you for being the first commenter of my previous post on the Australian Willow. This is my entry for Today's Flowers # 90. My grateful thanks to the TF folks: Santilli, Denise, Pupo and Valkyrien for hosting Today's Flowers. To participate or view other floral displays around the world, click here. I would like to dedicate this post to my friend, Radhika, from Ever Green Tree blog, the first commenter of my previous "Phaleria capitata" post. I have learnt a lot from her, including this beautiful phrase "We can learn a lot from the trees - they are always grounded, but never stop reaching heaven wards.... ~ Everett Manor "
Phaleria capitata - A Rare Plant ? Have you seen this flower or plant before? Update: The secret has been revealed ! - see comments. The flowers look like Jasmine while the fruits are red like berries and they grow from the smooth branches and tree trunk! There is not much information available, so I hope you can help me. Red berries attached to the tree trunk. Maybe these are poisonous and used by the Orang Asli (aborigines of the land)??? Some sources of information says the plant is from Sumatra, Indonesia while others report that it is found in Central Celebes, Sulawesi, New Guinea, Philippines and Borneo. Some even call it 'gora hutan' and 'gaharu buaya' (crocodile agarwood) in malay but it may not be the correct common name. The flowers are hemaphrodite* and emerge directly from the branch. Where's the flower stalk? This evergreen shrub is grown at the rooftop Secret Garden of 1-Utama by Dr. Francis Ng, who had won the David Fairchild Award for botanical exploration 2009. My post today is dedicated to Mr Costas Tzagaratas from Greece of Nature Digital blog. His latest post is featuring beautiful spring flowers. This is my entry for Today's Flowers #89. To view other participants around the world, click here. Today is Garden Bloggers Bloom Day for April 2010. 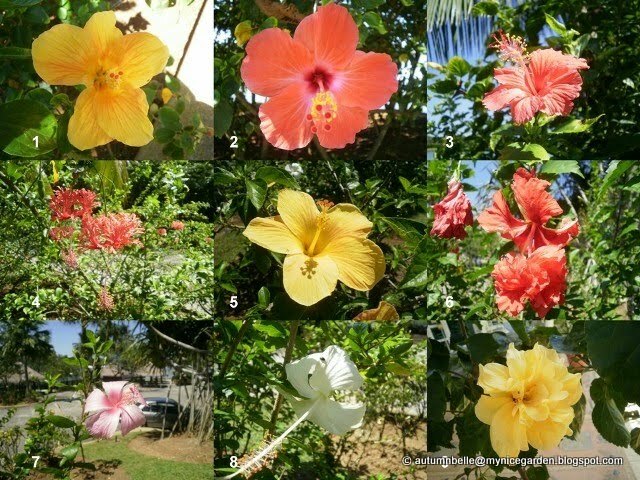 For this special occassion I have selected hibiscus flowers. All the pictures are taken today, in the morning and afternoon. This is my Hibiscus rosa-sinensis "Brilliant Red", the National Flower of Malaysia. What I notice about the hibiscus flower is that it doesn't fade as the day gets hotter. It remains just as beautiful under the mid-day sun even after the leaves has started to droop as a result of the heat. The same applies to the plucked flowers. It remains fresh the whole day and only start to fade after sunset. Blastoise, my pet tortoise loves to eat hibiscus flowers, the fresh ones as well as the those that had faded and dropped to the ground. He also love to eat the tiny insects which he catches while crawling around my backyard. He loves bananas too! This is my variegated leaf hibiscus. Blastoise also love to eat this flower. In fact, he love all varieties of H. rosa-sinensis flowers, single or double petal ones. This is my H. rosa-sinensis "Scarlet Giant". I grow it as an ornamental plant in a flower pot. It is 'The Beauty Queen' everytime it blooms in my garden. It is blooming today! Hey, do you like her? Remember the nest that dropped to the ground. The post is here. This is the mum. The 5 little baby birds has grown up and flew off the nest together with the whole family. I am delighted to dedicate my post today to Bangchik from Putrajaya, Malaysia of My Little Vegetable Garden blog. Bangchik has green fingers and his specialty is in growing vegetables. 1. Now, do head over to May Dreams Garden to see what's happening today around the world today. 2. I am linking in to Fertilizer Friday too, hosted by Tootsie at Tootsietime. I visited The Botanical Garden of Putrajaya recently and took these pictures along the Hibiscus Walk. In Malaysia we can find many many types of hibiscus flowers that grows well in our climate and soil. Hibiscus is our National Flower and the actual species is Hibiscus rosa-sinensis (Brilliant Red). Currently, I have 3 hibiscus plants (all Hibiscus rosa-sinensis) in my garden. I have tried eating its buds (stamens included) and petals and it tasted good. Blastoise, my pet tortoise love eating hibiscus flowers too. I'd love to grow flower no. 9 in my garden as it is so gorgeous. If I have a bigger space, I'll grow flower no. 4 H. schizopetalus (common name: chinese lantern/japanese lantern) and let it spread out gracefully over an arched arbor. Do you have hibiscus in your garden and which one is your favourite? My post today is dedicated to Nancy from Austin, Texas, USA of Nancy's Notes blog (first commenter). She is currently having a very happy occassion and do head over to her blog with your best of the best wishes! I would like to dedicate this post to Keats The Sunshine Girl, from Malaysia of blog, the first commenter of my previous "Butterfly Laying Eggs" post. Keats is an excellent writer and always brings sunshine to my blog with her visits and comments. To readers who happen to read this post, may you all be blessed. This picture was taken by a friend, a young engineering undergraduate during a visit to The Secret Garden of 1 Utama, a rooftop garden that practises green concepts and technology. It is a butterfly in the process of laying eggs on the underside of a leaf. A life cycle is just about to begin and it made me realise how delicate but wonderful life is, and how beautiful nature can be. Let's do our part to take good care of our environment. Like the saying by Richard Buckminster Fuller, "There is nothing in a caterpillar that tells you it's going to be a butterfly". I hope that many people will think twice before they kill a caterpillar. Butterflies are pollinators, therefore beneficial insects. They are indeed "Blessings" on Mother Earth. Without them, where will we get our fruits and future generations of plants to eat? This is my entry for Words That Inspire - An April Challenge, a meme initiated by Noel at A Plant Fanatic Blog. Do head over for more inspirations around the world. My post today is dedicated to Ms Helen (islandgal246) of My Rustic Bajan Garden blog. She taught me how to 'catch' (photograph) butterflies in the morning. Now, I am rewarded with many butterfly pictures for my collection. May she receive this beautiful Irish Blessing each and everyday. To my friends all over the world, Happy Easter Sunday! April 5th is also Ching Ming Festival, a day when we visit the graves and pay respects to the ancestors. It is a Chinese tradition where quite often, it is also a family gathering of relatives from far and near, a time for reminiscing and bonding. Have a smooth and safe journey!